I think everyone had a collective sigh of relief when the snow finally melted. I don’t remember ever having a winter as brutal as the one we just had. Canadians (and many Americans too) were saying to themselves, “C’mon Spring!”. I think it’s finally here (knock on wood). It’s not quite swimsuit or short weather here in Nova Scotia, but we’ve had a couple warm days. Last week, I even asked John if we could install our air conditioner. It’s time to get ready for the nice weather! For me getting ready for warmer temperatures means a couple things. I add my summer clothes to our closets and drawers, install the air conditioner in the window, clean up the yard and ensure my supply of sunscreen is well-stocked. This year my family is wearing SunZone sunscreen. 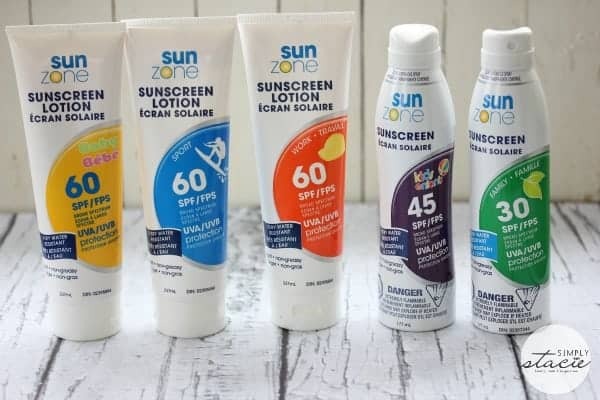 Back in January, I posted that SunZone sunscreen is brand new and proudly Canadian. They have a wide range of sunscreens in their product line up– to suit whatever your needs may be! It is the only sunscreen manufacturer that formulates, develops and produces a complete line of sunscreen. Furthermore, all SunZone sunscreens are made with natural ingredients and antioxidants like Aloe, Vitamin E and Green Tea extract. They protect your skin AND moisturize too. If you’re concerned about parabens and PABA, don’t be. They are free of both. The lotions are dermatologist test, hypoallergenic and non-comedogenic. I have sensitive skin and I’m totally fine wearing SunZone products. My skin feels so soft after applying it and it does not leave a greasy residue. I definitely don’t need that on my face since it’s already enough (darn oily skin!). Have you heard of Oleosomes? SunZone uses a patented Oleosomes Technology which is described as a “unique emulsifier and delivery system found naturally in planet seeds. If you want to learn more about Oleosomes, check out this video that SunZone has shared to explain more about it. This technology means that SunZone sunscreens can significantly reduce the amount of active chemicals to achieve the SPF levels. They gave me an example of a leading national brand SPF 60 kids lotion containing 30% active chemicals compared to SunZone SPF 60 Kids having only 7%. 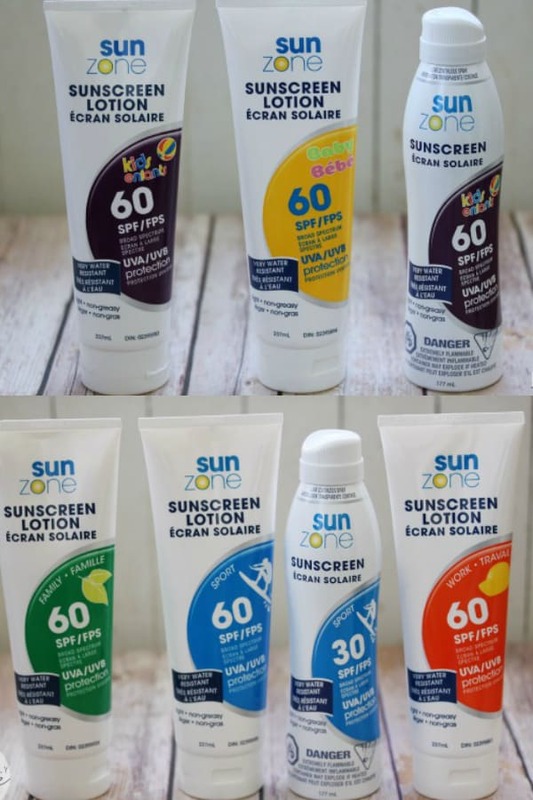 I received five SunZone sunscreen products to use on my family. I’ll give you a rundown on each of them as well as the SunZone Spray/Wet. SunZone Sport: Perfect for people who are active in sports. Sweat away. This sunscreen is water resistant for up to 80 minutes. It comes as a lotion in SPF 30 & SPF 60, spray in SPF 30, SPF 45 & SPF 60 and Mini Spray in SPF 30 & SPF 50+. When I’m exercising outside, I’ll be wearing the SPF 60 lotion. SunZone Work: Provides maximum coverage for outdoor work and activity. It’s water resistant so you’ll be protected in a light rain, around water or if you are sweating. John is out helping a friend put siding on a house today and he’s wearing this sunscreen. It’s available in SPF 60 lotion, SPF 30 mini spray and SPF 50+ Mini Spray. SunZone Family: Gives your entire family coverage from the sun’s rays. It’s safe to use on children too. It’s also recommended that you apply every two hours to prevent sunburn so bring the bottle with you if you are heading out for the day. It comes as a Lotion in SPF 15, SPF 30, SPF60, Spray in SPF 30, SPF 45, SPF 60 and Mini Spray in SPF 30 & SPF 50+. SunZone Kids: Sunscreen made for your little ones providing maximum protection with fewer chemicals. It comes in Lotion in SPF 60, Spray in SPF 45 & SPF 60 and Mini Spray in SPF 30 & SPF 50+. SunZone Baby: Made for use on children less than 6 months in age. It comes as a Lotion in SPF 60. SunZone SprayWet: Designed to be applied on wet skin. It’s formulated to cut through water onto wet skin without running or whitening. It comes as a Spray in SPF 50+ and Mini Spray SPF 50+. I’ve tried both the lotion and spray format. Either one works great. The spray is good for those hard to reach spots and goes on as a light sheer mist. Want to try out SunZone sunscreens? Contact them to find a retailer in your area OR buy them online at Amazon.ca! Sunny weather we are ready. I say bring on summer! Read the expiry date. If you aren’t sure whether or not the bottle you have will ensure maximum protection, throw it out to be on the safe side. from the site i learned that SunZone is Paraben free. I like the Spray Wet Sunscreen, because I like to spend my time in the pool! I learned that they are water resistant. I learned after visiting the website that SunZone Sunscreen Lotion formulas contain patented Oleosomes Technology, which is a unique emulsifier and delivery system found naturally in plant seeds. So cool!!!! I like that the products have less chemicals. Wow. The work sunscreen has Oleosomes from plant seeds for moisturizing benefits, greater protection and less active chemicals. This all sounds so much healthier than other sunscreens! I love that the kids’ sunscreen lotions are free of PABA and paraben! I like that the line is made of natural ingredients. I like the spray wet for my grand kids. I learned they are made with all natural ingredients.